My understanding of 'Go See, Ask Why, Show Respect' applied to health care got a wake-up call last week. 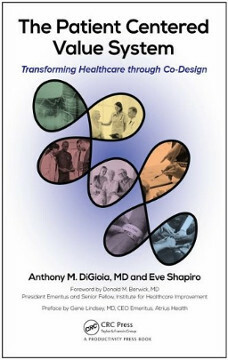 I read a new book by Dr. Tony DiGioia and Eve Shapiro, The Patient Centered Value System: Transforming Healthcare through Co-Design (2018, CRC Press, Boca Raton, FL). The book summarizes Tony’s thinking and experiences in three components that comprise the system in the book’s title: shadowing, patient and family centered care methodology, and time-driven activity based costing (‘TDABC’). Tony, an orthopedic surgeon, has worked for more than 12 years to develop and practice patient-centered care. Select a care experience (e.g. trauma care, elective joint replacement). Establish a care experience guiding council (sponsor, administrative and clinical champions, a program manager). Expand the guiding council into the working group (get representatives from all work teams or units that provide or support the care in the selected care experience; patient and family representatives are welcome, too). In step 6, use the same six steps to generate specific ideal work flows and responsibilities, test in practice and make reliable (again, patients and families are welcome members of project teams). The PFCC method provides a natural way to engage patients and families in co-design. Rather than ‘bolting on’ patients and families to a health system-centric view of production and improvement projects, patients and families are integral. In the Shadowing step, patients and families are the center of attention. In subsequent steps, they participate in the design of ideal service and serve on targeted service feature teams as core members. If your system is making stuff, the 'Go See, Ask Why, Show Respect' activity guides you to interact with the people making the stuff ‘in the factory’. However, health is produced by co-creation of patient, family, and care team(s) interacting in a social and physical environment. That means we should ‘Go See, Ask Why, Show Respect’ with attention to the patient, family and the care teams. In other words, if your system is making health, then effective 'Go See, Ask Why, Show Respect' activity must include patient, family and care teams. Shadowing is a natural way to practice ‘Go See, Ask Why, Show Respect’ in health care. In PFCC, patients and families are not incidental to the care experience. They are not the ‘stuff in the factory’; rather, they are the center of attention and participants in designing effective care. If people working in health systems follow Tony’s advice and put patients and families at the center of observation and design of care experiences, they will apply their improvement skills more humanely and, ultimately, more effectively. As Tony describes in Chapter 8, it's vital to characterize cost of services in order to manage and improve the cost of health care. This post contains links to several TDABC articles and describes 'Lean Accounting' as another method to make production costs visible to managers and clinical teams.